The OMG-CONV-485 series has been discontinued. Please see the CAT-285 as a possible alternative or contact our Data Acquisition Engineering department. 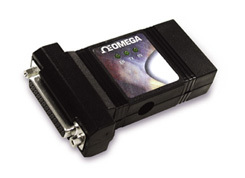 The OMG-CONV-485 interface converter allows a standard RS-232 port to communicate with an individual RS-422 device or with multiple devices within an RS-485 network. The OMG-CONV-485 supports RS-422 full duplex mode as well as RS-485 full or half-duplex master and slave modes. This gives the user flexibility in configuring the device to meet their specific application needs. Onboard LED’s are included to indicate that the device is properly powered and also illuminate when the device is transmitting and receiving to assist in verifying acceptable communications. A six-position screw terminal block on the board provides connection to external devices. Provisions for strain relief are made within the case by a cable clamp/screw combination. This eliminates unwanted wire disconnects once the screw terminals are wired. The OMG-CONV-485-ISO is an isolated version of the OMG-CONV-485. Isolation is important in installations where the equipment connected to the PC is either located far from the host system, or on a different power transformer circuit. Isolation on the OMG-CONV-485-ISO eliminates the effects of ground loop current, a commonly neglected and misunderstood phenomenon that leads to data errors and the destruction of communications equipment. The Auto Baud feature allows the device to operate without the presence of RTS software. This reduces system overhead and allows the OMG-CONV-485 to operate flawlessly regardless of the operating system. 참고: All OMG-CONV-485 converters include RTS control software, and a complete user ‘s manual on CD ROM and an AC adaptor.